Dr. Danielle and our staff will do everything we can to help your child avoid dental decay through oral hygiene guidance and professional check-up, but sometimes, those frustrating cavities pop up anyway. In these situations, we’ll treat the damage as soon as possible with a custom dental filling. The service only takes a single appointment – we’ll thoroughly clean the tooth, place the filling material, and secure it in place. All the while, your child will be kept comfortable and entertained through fun amenities and (if needed) sedation dentistry. 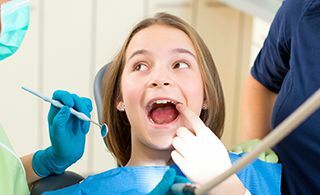 Several high-quality filling materials are available at Pediatric Dentistry of Prospect; the location of the affected tooth and other important factors will help us determine the best choice for your child’s unique smile. Contact us today to schedule a first appointment! New patients from Green Spring, KY and other nearby areas are always welcomed.